are needed to return all hats (including the extra ones) to their rightful owners? My fancy new digital alarm clock is broken! The time 'jumps' around. When I reset it, it reads 12:00:00. Then it runs as it should, but after 12:04:15 it resets back to 12:00:00. It counts up to 12:04:15 again and then it jumps to ... 12:08:32 ! Weird stuff. Do you know what's wrong with my alarm clock? Solution posted by Saumya Gupta, Abhimanyu Dhamija (CSE IITB 2011 Alumnus, Citibank Analyst) and Naga Vamsi Krishna in comments! The aim is to predict what the count will be when you encounter the second black Ace in the deck. 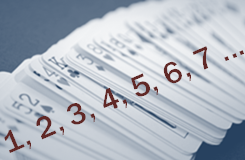 If you had to select one position before you started to deal, what number would you select that maximizes your chance of guessing the location of the second black Ace?